So, I opened up the package and was quite impressed- it was actually pretty big, and it reminded me of an oversized peanut butter patty. I took a bite and found that it was sweet, but not sugary sweet. It had more of a mild honey flavor. The milk chocolate on the outside was smooth, with peanut butter on the inside. There was also I believe crisp rice on the inside of the patty, which kind of took away from the peanut butter flavor. I sort of wish the crisp rice wasn’t there, and it was just milk chocolate and peanut butter. Otherwise, a nice treat. It is a tad high in fat, 10 grams per Golden Smacker, but it does have 6 grams of protein! If I’m going to eat a treat, there might as well be some protein in it to help keep me full! I give it 3 1/2 stars overall. 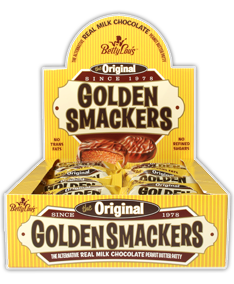 1 Original Milk Chocolate Golden Smacker is 190 calories, 10 grams of fat, 20 grams of carbohydrates, 11 grams of sugar, 2 grams of fiber and 6 grams of protein. 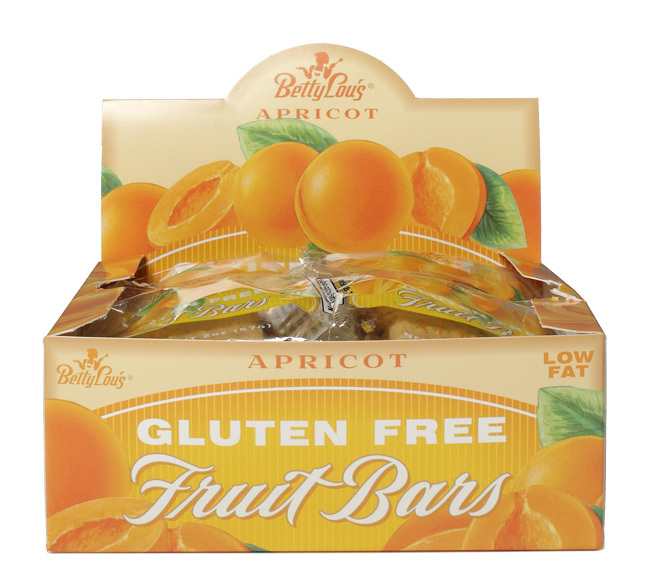 BettyLou’s makes Just Great Stuff Bars that come in four flavors, Organic Superberry Acai Bar, Organic Chocolate Dream Greens Bar, Organic Cocoa Acai Bar, and Organic Fruit & Veggie Bar. The nice folks over at BettyLou’s sent me them to try, and today I’m reviewing the Organic Superberry Acai Bar and Organic Fruit & Veggie Bar. Both of these bars are rather sort of gummy and chewy in texture, and certainly remind me of fruit bars or fruity type snacks. According to the package, they both are organic, vegan, and gluten free. Organic Fruit & Veggie Bar- 1 bar is 170 calories, 6 grams of fat, 23 grams of carbohydrates, 2 grams of fiber, 15 grams of sugar, and 5 grams of protein. Organic Dried Fruit Blend (organic raisins, organic dates, organic bananas [with organic rice flour]) Organic Raw Cashews, Organic Tapioca Syrup, Organic Freeze-Dried Vegetable Blend (organic carrot juice, organic spinach leaf, organic broccoli sprouts organic kale), Organic Rice Protein, Sunflower Lecithin, Organic Vanilla Extract, Organic Sunflower Oil, Sea Salt. 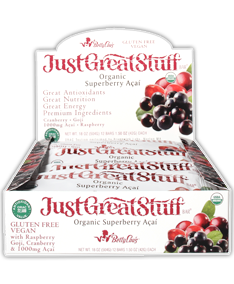 Organic Superberry Acai Bar-1 bar is 180 calories, 7 grams of fat, 24 grams of carbohydrates, 3 grams of fiber, 13 grams of sugar, and 5 grams of protein. Organic Raw Cashews, Organic Berry Blend (organic dried cranberries [with organic apple juice concentrate and organic sunflower oil] organic goji berries, organic freeze-dried raspberries, organic freeze-dried acai [with organic lime juice and/or citric acid]) Organic Dates, Organic Tapioca Syrup, Organic Rice Protein, Organic Sunflower Oil, Organic Raspberry Flavor, Sunflower Lecithin, Citric Acid. Betty Lou’s is a company that makes a large assortment of foods, from granola bars to protein balls, and even cookies too! They make products that cater to the needs of many, such as products that are gluten free, dairy free, organic, etc. 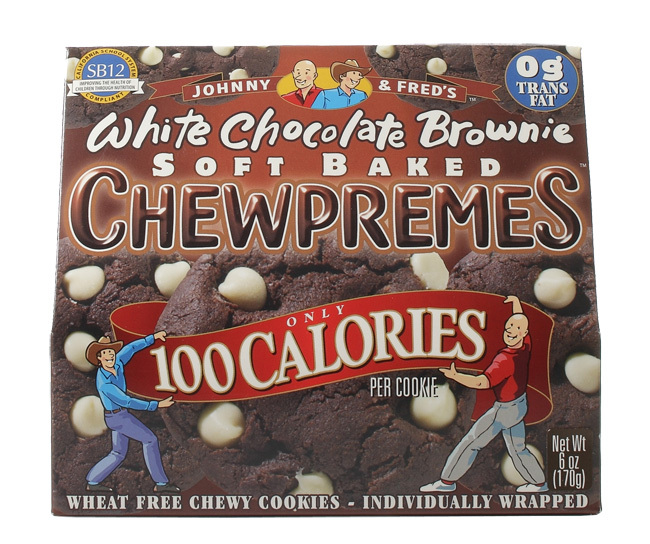 The folks at Betty Lou’s were super generous and sent me some of their products, including 3 of their Johnny & Fred’s Chewpreme cookies. These cookies are 100 calories each, and come in 3 flavors, White Chocolate Brownie, Oatmeal Raisin, and Peanut Butter Chocolate Chip. They are your standard size cookie, at 1 oz each, they are not too big but not bite sized, and are made with all natural ingredients. I tried the White Chocolate Brownie one first, as it looked the most exciting. It was a dark cookie with white chocolate chips throughout. I took a bite out of it, and, WOAH! This cookie is GOOD! It was FUDGY! Just like a brownie! Sweet and chewy, with a lovely chocolatey flavor. The white chocolate chips were so tasty, crispy and sweet like vanilla. this one gets 4 1/2 stars and is my favorite of the 3 cookies. 1 cookie is 100 calories, 4 grams of fat, 17-18 carbohydrates, 2-3 grams of fiber, and 2-3 grams of protein. White Chocolate Brownie- Organic Whole Grain Barley Flour, White Chocolate Chips (Sugar, Cocoa Butter, Nonfat Dry Milk, Milk Fat, Soy Lecithin, Vanilla), FruitrimR (Fruit Juices, Grain Dextrins), Brown Sugar, Safflower Oil, Cocoa Powder, Eggs, Inulin (dietary fiber), Natural Flavors, Baking Soda (leavening), Sea Salt, Mixed Tocopherols (Natural Vitamin E). Oatmeal Raisin- Raisins, Organic Whole Grain Oats, Organic Whole Grain Barley Flour, FruitrimR (Fruit Juices, Grain Dextrins), Brown Sugar, Walnuts, Safflower Oil, Eggs, Inulin (dietary fiber), Organic Cane Sugar, Natural Flavors, Baking Soda (leavening), Spices, Sea Salt, Mixed Tocopherols (Natural Vitamin E). Peanut Butter Chocolate Chip- Organic Whole Grain Barley Flour, Peanut Butter, FruitrimR (Fruit Juices, Grain Dextrins), Chocolate Chips (Sugar, Chocolate Liquor, Cocoa Butter, Soy Lecithin, Pure Vanilla), Brown Sugar, Eggs, Organic Cane Sugar, Inulin (dietary fiber), Peanut Flour, Natural Flavors, Baking Soda (leavening), Sea Salt, Mixed Tocopherals (Natural Vitamin E). Betty Lou’s is a company that offers a little something for everyone, while still only using all natural, premium ingredients. The company’s snacks range from being gluten free, wheat free, vegan, dairy free, corn free, and more! 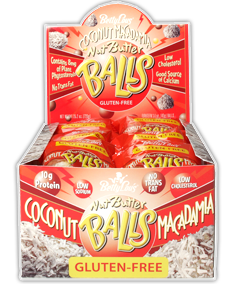 No matter what you have to avoid, you will be able to find some snacking comfort with Betty Lou’s products. Betty Lou’s sent me some of their snacks to try, and today’s review is on the Jumbo Fruit Bars. They come in Apple Cinnamon, Blueberry, Cherry, Apricot, and Strawberry, and are gluten free. Before I start, don’t be fooled by the word “jumbo“- they are not huge. They do have more filling than a usual fruit bar that I would buy in the store (with a crust-like outside), but not a LOT more. They are also square in shape, rather than rectangular like the other bars. 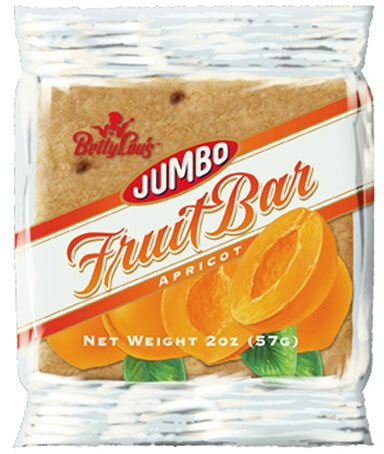 John, from Betty Lou’s wrote to me about the bars- “Taste like a little piece of pie & are only sweetened with fruit”. Did someone say pie? and only sweetened with fruit? I decided to try the Apple Cinnamon, Blueberry, and Apricot flavors. All of them had a decently thick crust (about the size if you stacked 2-3 quarters), filled with gooey and sweet fruit filling. Blueberry- this one was good. It had actual chunks of baby blueberries in it, which made the fruit filling thick and sweet, but not too sweet. It also had a bit of tartness to it. The crust was graham-cracker like (delish!! ), and crumbly. Each bar is 180-210 calories, 3 grams of fat, 39-44 carbohydrates, 5 grams of fiber, and 2 grams of protein. Blueberry-Blueberry Fruit Filling (Fruit Juice Concentrate [Peach, Pear, Pineapple, Apple], Blueberries, Apples, Inulin, Tapioca Starch, Apple Powder, Natural Flavor, Citric Acid, Pectin, Locust Bean Gum, Organic Rice Flour, Red Cabbage Extract for Color), Fruitrim® (Fruit Juices, Natural Grain Dextrins), Gluten-Free Oats, Gluten-Free Flour Blend (Potato Starch, Brown Rice Flour, Stone Ground Sorghum Flour, Tapioca Flour), Safflower Oil, Inulin (dietary fiber), Water, Guar Gum, Xanthan Gum, Sea Salt, Cinnamon, Baking Soda, Ginger. Apricot- Apricot Filling (Fruit Juice Concentrate [Pear, Pineapple, Apple, Peach], Apricots, Inulin, Tapioca Starch, Apple Powder, Natural Flavor, Apricot Juice Concentrate, Water, Turmeric and Annatto Extract for color, Citric Acid, Pectin, Locust Bean Gum), Fruitrim® (Fruit Juices, Natural Grain Dextrins), Gluten-Free Oats, Gluten-Free Flour Blend (Potato Starch, Brown Rice Flour, Stone Ground Sorghum Flour, Tapioca Flour), Safflower Oil, Inulin (dietary fiber), Water, Guar Gum, Xanthan Gum, Sea Salt, Cinnamon, Baking Soda, Ginger. Apple Cinnamon– Apple Cinnamon Fruit Filling (Fruit Juice Concentrate [Pear, Pineapple, Apple, Peach], Apples, Inulin, Tapioca Starch, Natural Flavors, Apple Powder, Zante Currants, Citric Acid, Pectin, Water, Cinnamon, Locust Bean Gum, Annatto Extract and Turmeric for color), Fruitrim® (Fruit Juices, Natural Grain Dextrins), Gluten-Free Oats, Gluten-Free Flour Blend (Potato Starch, Brown Rice Flour, Stone Ground Sorghum Flour, Tapioca Flour), Safflower Oil, Inulin (dietary fiber), Guar Gum, Xanthan Gum, Sea Salt, Cinnamon, Baking Soda, Ginger.